David Arwood, an elementary school teacher in rural northeast Tennessee, was looking for a memorable way to show his students how diverse and large the world is. He wanted his class to not only see how many different languages and cultures were out there, but get a glimpse into the different ways people lived. Yet despite our differences he wanted to demonstrate that we were all connected. Postcards he thought. If he could somehow get people from other states and countries to send his class a postcard, his students could not only reply back but they could connect real people to a generic map of the world. So he decided to start reaching out to every state and country-specific subreddit he could find on reddit and asked the community if they would consider sending a postcard to his school. Arwood was persistent. He reached out to hundreds of online communities and before he knew it, the postcards came flooding in. His class was amazed and they started to track the results on a large wall outside their classroom. 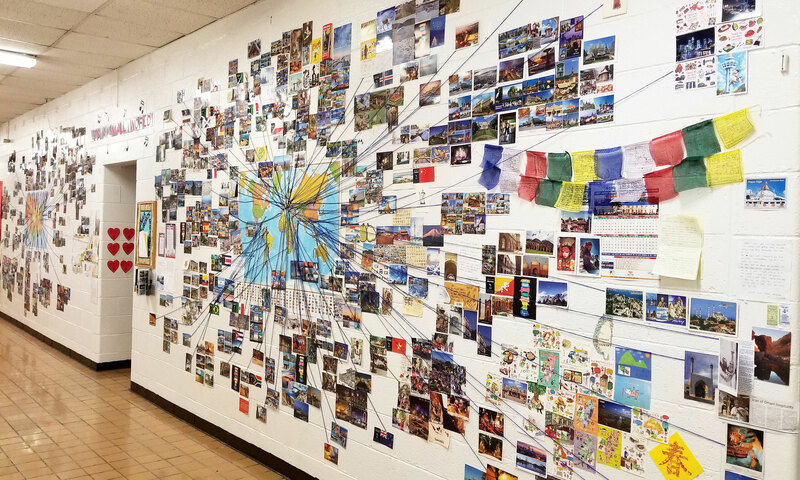 Before they knew it, the project had overtaken an entire wall and now the entire school could see the fascinating postcards the class had received from all around the world. To date, the class has received postcards from every single US state along with 90 countries around the world. You can see a higher resolution of the current wall here.